New Interactive Sample of Exploratory Exercise Just Posted! As you may know, I enjoy using Articulate Storyline to create eLearning solutions for my clients. And Articulate has built up an impressive eLearning Heroes community of users on their web site. Each week in the forums, Community Manager David Anderson posts a new eLearning challenge. Anyone who has a little spare time is invited to participate. I’m usually too pressed for time to join in, but I’ve enjoyed checking out some of the creative solutions other community members have offered on the various challenges. 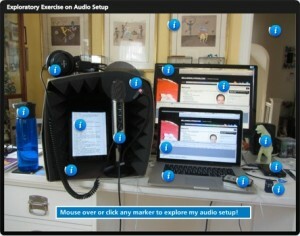 This week, however, the challenge was about audio setup tips, and while I was late to the game, I had an hour to spare. After all, I’m an actor and I do professional voiceovers. So I jumped in and came up with a response. I’ve posted this exploratory exercise on my eLearning Samples page. You can view it there, or jump directly to the exercise by clicking here.